Commander Anthology comes out this Friday, inviting us all to enjoy some of our old favorites from past Commander products, such as Kaalia of the Vast and Derevi, Empyrial Tactician. The Anthology deck I’d like to spend some time on is Plunder the Graves, featuring Meren of Clan Nel Toth. Before Commander 2016 gave us Atraxa, Praetors’ Voice and Breya, Etherium Shaper, Meren was on course to surpass Oloro, Ageless Ascetic as the most-built Commander deck of all time. It’s not hard to see why she’s so popular; Meren gives you experience counters every time your creatures die, then turns that experience into powerful necromancy, reviving a creature from your graveyard. What’s not to love? However, there’s another commander out there, in similar colors, who also lets you revive your creatures from the graveyard. His deck may not be reprinted in this Anthology, but he’s the most-built commander in his colors, and, as a ghost himself, he’ll make sure the past never dies. That’s right, it’s Karador, Ghost Chieftain. Much like Gisa and Geralf, which we discussed last Showdown, Karador lets you cast creatures from your graveyard. Fortunately, he isn’t restricted to just zombies, like Gisa and Geralf. Unfortunately, you do still have to pay mana for those creatures, a cost Meren sidesteps by reviving creatures for free. Still, Karador has many other upsides. First of all, he’s an additional color, which broadens the range of creatures he can resurrect. Second of all, he discounts his own mana cost for every creature in your graveyard. It’s possible that Karador could cost you only three mana even if you’ve already cast him twice. Lastly, Karador doesn’t rely upon experience counters. It’s difficult to prevent a Meren player from accumulating experience, since creatures dying is such a common part of the game, but if a Meren player can be kept off her experience, it can really slow her down. Karador doesn’t care about any of this. The first creature he revives could be an Acidic Slime for all he cares, so long as you have the mana. For those familiar with Modern, this list probably looks similar to the “Birthing Pod” decks that were prevalent in the format years ago. Before the card was banned from the format, this deck featured the titular card Birthing Pod and a smattering of ‘toolbox’ creatures with niche effects that could be useful in a variety of situations, from Shriekmaw to Scavenging Ooze to Eternal Witness. That’s exactly the kind of deck Karador likes to be. Since he can revive any creature from his graveyard, his deck can be filled with unique creatures, each of which provides answers to different threats. If an opponent has a nasty Doubling Season out, Karador can replay an Acidic Slime to shut it down. If an opponent has gone all-in on a voltron commander, Karador can replay his Fleshbag Marauder. Much like Karador, Meren has many of the same toolbox-y elements in her deck. Reclamation Sage for pesky artifacts and enchantments, Spore Frog for defense, and so on. It’s also important to note the presence of cards like Avenger of Zendikar and Grave Titan in her list, which don’t show up for Karador. However, I think the best way to illustrate the differences between these two commanders is with a good ol’ Venn Diagram. Karador’s column, however, tells us a whole lot about his playstyle. Unsurprisingly, many of those toolbox cards like Fleshbag Marauder and Acidic Slime show up in our “Both” column. Each of these provides an awesome amount of value when played multiple times, so they’re great fits for both decks. Remember those Modern “Birthing Pod” decks Karador resembled so much? Well, he has something else in common with them too; many of those Modern decks were actually named “Melira Pod,” because they featured combos such as Melira, Sylvok Outcast + Kitchen Finks + Viscera Seer. Combos like this are bread and butter for Karador decks. 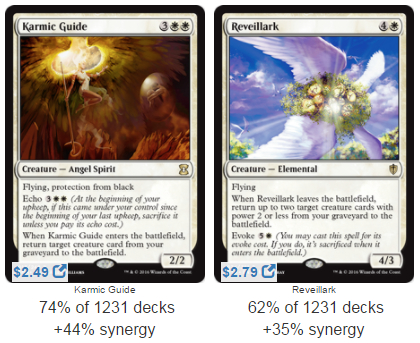 At the very top of his column we find his combo pieces: Reveillark + Karmic Guide. 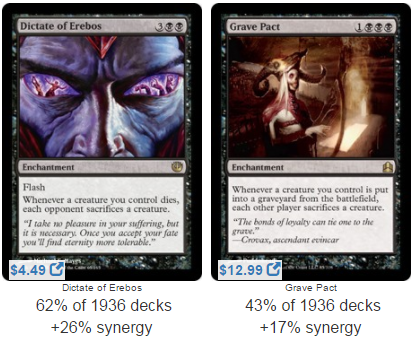 Combine these cards with a sacrifice outlet and a Blood Artist and you’ve won the game. Saffi Erikdotter, Sun Titan and Renegade Rallier also show up in his column as additional avenues to Combo Town. Birthing Pod isn’t Karador’s only tutor, either; his column also contains cards like Fauna Shaman, Demonic Tutor, and Eldritch Evolution, to find those combo pieces more quickly. These cards really solidify Karador as the quintessential toolbox commander with the potential to go infinite at the drop of a hat. Karador players have also been known to run the “Boonweaver combo,” which utilizes Boonweaver Giant + Pattern of Rebirth + [insert sacrifice outlet here] to tutor out any and every creature in your library. These cards don’t show up in his average decklist above, but they’re still worth mentioning. 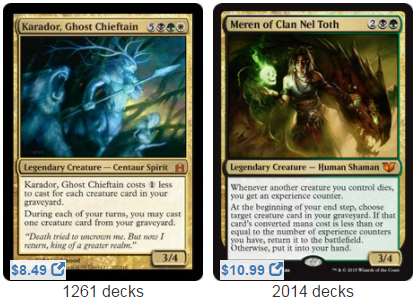 By contrast, Meren’s column shows us an emphasis not towards combo, but towards creatures. The standout is Dictate of Erebos. This, along with Grave Pact and Butcher of Malakir, are excellent forms of removal, but they do rely on how many creatures you have. Thankfully, we know that Meren loves having lots of creatures; remember, we saw from her decklist that she’s more likely to play those army-tastic cards like Avenger of Zendikar and Grave Titan. And speaking of armies, that Mazirek, Kraul Death Priest in her column makes her masses of creatures even more frightening. Since Karador likes to combo, and defeat his opponents right on the spot, he has less need of effects like Dictate of Erebos. Meren’s goal is more gradual, and a bit more straightforward: crush you enemies by having more (and more powerful) creatures than they do. This isn’t to say Meren can’t combo; I’ve witnessed firsthand a Meren deck that sacrificed and revived a Gray Merchant of Asphodel thirty times in one turn to win the game. In general, though, Meren decks tend to assemble legions, while Karador likes to assemble combos. Now that we understand each of these commanders a little better, let’s take a look at some cards that aren’t very popular on their EDHREC pages, but should probably see more play. Gaddock Teeg is an expensive card. I always advocate for playing within your budget, so by no means should you break your piggy bank just for this little guy. But if you have a copy, consider it for this deck. Karador likes casting creatures—almost exclusively, in fact—which means Teeg can shut down all those big-spell Mizzix of the Izmagnus and Kruphix, God of Horizons players without affecting your strategy at all. Think of him as a much smaller Void Winnower. Along those lines, Peacekeeper is a great stall tactic, one that Karador can turn on or off at will. Meren decks are famous for playing Spore Frog, which is also a pretty decent way to keep your life total intact, but Peacekeeper can stop aggression from every opponent, not just one. If you’re a Karador player who likes their life total, check this one out. And if you like Spore Frog, check out Kami of False Hope too. Crypt of Agadeem. This maybe too slow, but I’m not sure. Regardless, Karador clearly likes having creatures in your graveyard and so does the Crypt. It’s like Cabal Coffers for dead creatures, and that seems useful enough that it should at least show up somewhere on Karador’s page. Right now it’s nowhere in sight, and that just feels wrong. Bane of Progress. Honestly, I’m recommending this for both decks. Yes, it hits your stuff too. Doesn’t matter. Karador is a toolbox commander, and for just one more mana than Acidic Slime, you upgrade from a hammer to a chainsaw. Plus, Karador’s combos can be completed entirely with creatures, so destroying your own permanents won’t always hinder you. Besides, if you lose anything valuable, like Birthing Pod or Altar of Dementia, you can get it back with Eternal Witness or Sun Titan. Deathreap Ritual. Everyone gushes about Phyrexian Arena, but I gotta be honest, I think Deathreap is way, way better. The Arena draws you a card on your upkeep, but Deathreap could draw you a card on each player’s turn. All it takes is creatures dying, which is a natural, unavoidable part of the game. For one more mana, this is like a green-black Rhystic Study. Okay, it’s worse than that, but still, don’t waste four bucks on an Arena when there’s a budget alternative with the potential to draw you more cards. Twilight’s Call. I’m surprised this card doesn’t show up on Meren’s page at all. Lots of decks are running Living Death, which is bonkers powerful. Twilight ain’t too shabby either, though. It may not remove all the creatures on the battlefield, but you’re still probably the person with the best creatures in the graveyard. Pattern of Rebirth isn’t just good for Boonweaver Giant. Meren is sacrificing creatures left and right, and this will let you get any creature you need. This is a build-your-own-Protean Hulk and you don’t even need combo pieces to make it powerful. Cauldron of Souls. I already recommended this card for a different commander, but I think it’s pretty powerful here too. Meren tends to have a lot of enters-the-battlefield effects that are worth getting multiple times. And yes, maybe the -1/-1 counter will kill your Reclamation Sage, but you’ll still get the Sage’s trigger. All I’m saying is that if you’re running Mazirek, Kraul Death Priest or Mikaeus, the Unhallowed, this pairs with both of them pretty nicely. So far the cards I’ve recommended for Meren have all been noncreatures, and that’s probably a mistake. Meren needs a lot of creatures, so the noncreature slots are really at a premium. I’ll try to correct that by recommending a card I mentioned before, and that’s Gray Merchant of Asphodel. He’s only seeing play in 32% of Meren decks, and that number should absolutely be higher. Don’t spend $16 on a Kokusho, the Evening Star. Gray Merchant costs a gumball and has the potential to drain even more life than the Kamigawa dragon. If he’s in your graveyard when you cast that Twilight’s Call and get all your creatures back, it feels really, really good. Commander Anthology contains some amazing legendary creatures from years past, and I hope you get the chance to play with some of them. This is as good an opportunity as any to look back in previous sets for old favorites, and maybe give them a go, for old time’s sake. Some enterprising souls may tell you never to look back, or that the past is dead. If Karador and Meren have taught us anything, though, it’s that the dead pack a serious punch.